Join Ledger David Cellars for our winter Primoris Wine Club pick up two weekends in December! Let’s celebrate December 8-9 & December 15-16 at Le Petit Tasting Room. Enjoy Ledger David’s ever popular 2016 Primoris Chenin Blanc, double gold medal winning 2015 Cabernet Franc and newest release 2016 Malbec. Even better? The 2015 Tempranillo Reserve is being released the first weekend in December for wine club members – just in time for the holidays. Purchase one bottle of 2015 Tempranillo Reserve for $30 and/or one bottle of Tempranillo port style dessert wine for $20 (this is in addition to your wine club selections). Limit 1 bottle of each wine at discount price per member. No additional discounts apply. Are your wines shipped direct? Please email McKayla@ledgerdavid.com by December 10, 2018 and let her know if you’d like 2015 Tempranillo Reserve for additional $30 charge or 2014 Tempranillo port style dessert wine for an additional $20 charge and we’ll be certain to include this wine in your shipment (without any additional shipping charges). Looking forward to private wine club hours? We’re hosting three separate evenings just for wine club members! Enjoy wines paired with delicious bites from 6-7pm December 8, 14, & 21. *An RSVP is required for the private seating hours Friday and Saturdays from 6-7pm so that we can offer personalized service & enough tasty fare for all. Limited seating available each evening. **Please note: we do our best to accommodate wine club members’ requests to sit together if requested at time of reservation. Due to event popularity & limited space we are not always able to accommodate larger group seating. Thank you for your understanding! Wine tasting & artisan bites. Celebrate wine club releases both weekends! SHIPMENTS: Wine club shipments will go out on Dec 11 & 12, weather permitting. PLEASE send an email to McKayla@ledgerdavid.com by December 10, 2018 and let her know if you’d like 2015 Tempranillo Reserve for additional $30 charge or 2014 Tempranillo port style dessert wine for an additional $20 charge and we’ll be certain to include this wine in your shipment (without any additional shipping charges). If you are unable to receive your shipment during the second week of December, please contact us ahead of time and we’ll hold for a better shipping date! 2014 Tempranillo Port-Style Dessert Wine for $20* (more than 40% off retail of $34, Limit 1). *No additional wine club discounts apply. We will be processing orders on December 3. It is important for us to run cards ahead of wine club to ensure a seamless and enjoyable wine club pick-up experience for our members. As a reminder, 3-bottle members receive a 15% discount, 6-bottle members a 20% discount and 12-bottle members a 25% discount on all wine club selections. 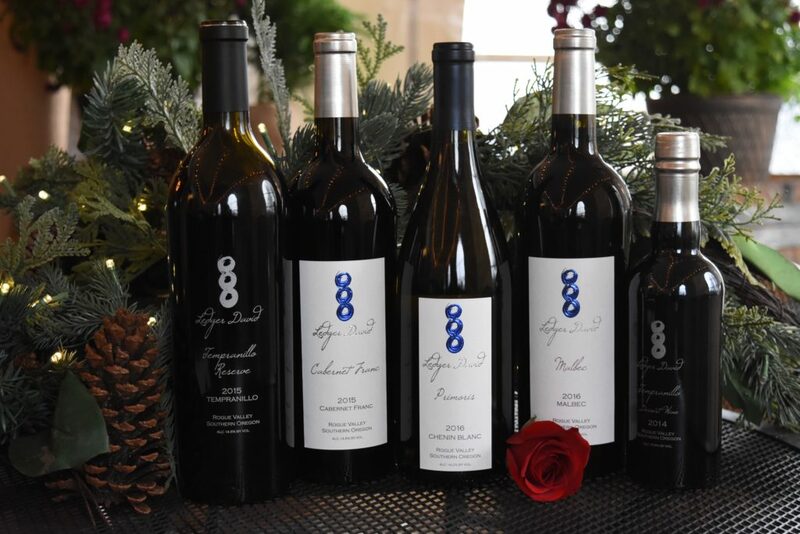 If you are unable to join us during wine club event weekends, your wine club selections will be available on or after Tuesday, December 4 at the tasting room in Central Point (next to the Rogue Creamery). Stop by any time during regular hours; noon to 5pm daily or contact us, and we will gladly ship your wines (shipping fee charged to your card on file).